UNLOCKED BLACKBERRY PRIV 32GB GSM UNLOCKED ANDROID SMARTPHONE - BLACK. New Blackberry Priv Phone ( Black ). Slider form factor, complete with a hardware 4-row BlackBerry keyboard. GSM / HSPA / LTE. GSM 850 / 900 / 1800 / 1900. New Blackberry Priv Phone ( Black ). Slider form factor, complete with a hardware 4-row BlackBerry keyboard. GSM / HSPA / LTE. 32GB of built-in storage; dedicated microSD card slot. GSM 850 / 900 / 1800 / 1900. Blackberry Priv Unlocked Android 5.4' 32GB GSM Smartphone- BLACK. New Blackberry Priv Phone ( Black ). Slider form factor, complete with a hardware 4-row BlackBerry keyboard. GSM / HSPA / LTE. 32GB of built-in storage; dedicated microSD card slot. The body may have light scratches, nicks, scuffs and/or tiny dents. Manual, SD Card, SIM Card. Not Included. Factory Unlocked works with all GSM carriers. BLACKBERRY PRVI 32GB BLACK UNLOCKED TO ALL NETWORKS! THE PHONE HAS BEEN TESTED AND IS IN EXCELLENT WORKING ORDER. THERE ARE A FEW SCRATCHES ON THE SCREEN AND BODY OF PHONE DUE TO GENERAL USE. ALSO A SLIGHT BIT OF DISCOLOURATION ON THE SCREEN WHICH IS HARDLY NOTICIABLE AT ALL. 1 x handset. Fully tested prior to dispatch. UNLESS STATED. PRICE IS FOR 1 PHONE ONLY. Why buy from us?. Black Original BlackBerry Priv 5.4" 3GB 32GB Unlocked Slider 3G/4G 18MP Android. It works on the AT&T network. Battery cove r.
Blackberry Priv (black). The phone is fully working fully unlocked. ON SALE NOW ! ---LAST 1 ! Excellent condition/ little sign of used. this is the one and only ONE. work anywhere in the world with a SIM-Card. 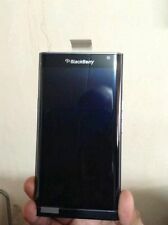 PRIV Pre-installed SIM Card (4FF). USB Quick Reference Guide Important. Blackberry bundle. 32gb Blackberry Priv and 32gb Blackberry Playbook. Both in great condition. No scratches on either device. Always in cases or sleeves. One small pixel shows on the screen occasionally depending on what function you are in. With one touch of the physical keyboard you’ll be hooked. 1 Luxury PU PC Phone Case Cover for Blackberry Priv - black leather. 1 Plastic Skin for For Blackberry Priv - black leather. 1 Ultra Thin Hard Rubberized Matte Plastic Snap-On Cover Case For BlackBerry Priv - Red. BlackBerry PRIV STV100-1 -32GB-Black(T-Mobile-Clean Esn)MINT CONDITION-WARRANTY! DTEKTM by BlackBerry warning system. - Capacitive touch 4-row BlackBerry keyboard. - Curved edge screen. Protection Corning Gorilla Glass 4. CPU Dual-core 1.8 GHz Cortex-A57 & quad-core 1.44 GHz Cortex-A53. BlackBerry Priv - 32GB - Black (Unlocked) Smartphone. Network: UNLOCKED. I DO NOT KNOW THE HISTORY OF THE PHONE. THIS PHONE IS FAULTY AND WILL NOT POWER ON. Up for sale is aBlackBerry Priv 32GB Black (Verizon) Smartphone Factory GSM Unlocked. The phone is being sold for parts or repair because the screen is cracked. There is also a green line on the LCd screen. Up for sale is aBlackBerry Priv 32GB Black (Verizon) Smartphone Factory GSM Unlocked. The phone is being sold for parts or repair because the screen is cracked. The phone is fully functional and works just fine but the screen is cracked. "Blackberry Launcher has stopped". This is being sold AS IS. Body: minor Wear. WE DO try to list everything that WE found to work when we tested it. Be sure to look through the photos so you can see the condition of this device. DTEKTM by BlackBerry warning system. - Curved edge screen. - Capacitive touch 4-row BlackBerry keyboard. PLATFORM OS Android OS, v5.1.1 (Lollipop). Stunning 5.4"" dual-curved screen. Protection Corning Gorilla Glass 4.